With emergency shelters running overcapacity officials at the Ottawa Mission are urging all candidates running for municipal council to commit more money to house vulnerable people as the weather turns colder. 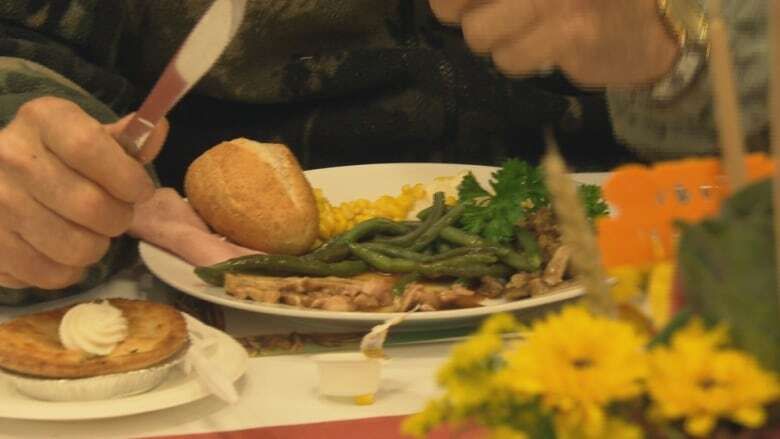 As volunteers served piles of mashed potatoes and slices of turkey at the Ottawa Mission's annual Thanksgiving Day luncheon, officials who run the emergency shelter say they are at overcapacity and are urging all candidates in the upcoming municipal election to commit more money toward services for the homeless. In a first for the shelter, there weren't enough beds to house all the residents from May to September, according to Peter Tilley, the executive director of the Ottawa Mission. The average occupancy rate was 107 per cent, Tilley said. Occupancy rates traditionally decrease during the warmer months. "If you were to come in here at night during the summer, there would be twenty mats down on the small chapel room floor," he said. "We're concerned for the next few months what are we going to do convert the dining hall at night or have people sleep in the waiting area …it's not safe." Emergency shelter occupancy rates can rise by 10 per cent or more in the winter, Tilley said. 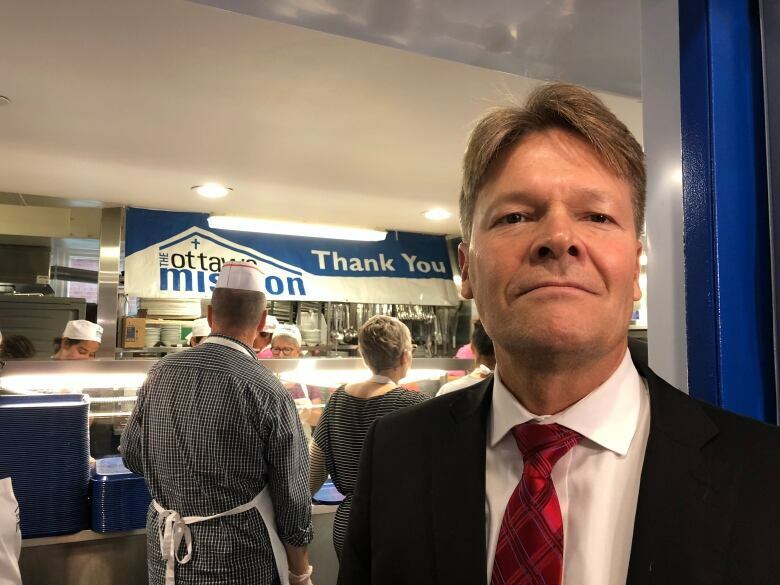 The city provides nearly 43 per cent of the Ottawa Mission's budget, but Tilley said the $44 emergency shelter per-diem rate paid by the municipality hasn't risen in five years. Given that food, heating, and other costs associated with feeding and housing vulnerable people are going up every year, Tilley argues the freeze in the daily rate isn't sustainable. "We're starting to make tough choices — like can we continue to run an education and employment centre funded by our donors money. If we continue to have a short fall for the basic necessities, are we taking from one to fund the other?" More than 48 per cent of the budget to run the shelter comes from donations through the Ottawa Mission Foundation and Tilley said that money is used for the dozens of programs it offers, like job training and addiction supports. Wearing a black apron and lending a hand serving meals, Rideau-Vanier Coun. Matthieu Fleury — who is seeking re-election — would not commit to raising the per diem rate from $44, arguing instead for a new funding stream to build badly needed non-profit housing for those languishing in shelters. In addition to a two-percent property tax increase, Fleury's campaign platform is seeking additional tax funds. "What I want this term, for us, is a levy of one per cent, which is an additional 14 million dollars that is targeted toward new units so we can have more housing options," Fleury said. "To release that pressure we need to build units and unlock capital funds and only during this term of council," Fleury said. While Tilley supports the idea of a one-per-cent levy, he balks at any suggestion that his shelter and others in the city are just feeding and giving an emergency bed to those in need. "The dialogue about the shelters and the work they are doing in the community has been very negative," he said. He said last year, his agency placed 230 people into safe, affordable housing. Less than two-per-cent return to the shelter, he said. Keith Larabie, 65, is one of those people who hasn't returned to live at the Ottawa Mission. After three decades of working in British Columbia, he came home to Ottawa when his health declined. With nowhere to live and little money, he lived for three months at the shelter. But earlier this year, housing staff at the Ottawa Mission found him an affordable apartment in a complex for seniors. "It's so nice to get up and have your own shower and kitchen and I can look out from my patio and get a great view of Gatineau," he said. Yet he still comes every day for meals at the shelter because living on a provincial disability pension leaves him short after he pays for his apartment. "I couldn't afford to cook this meal at home," he said, moving the gravy onto his slice of turkey. "Here I'm able to get a good healthy meal and socialize with people." The shelter serves on average about 2,500 meals on Thanksgiving Day to both residents and people like Larabie who struggle with finding the money to buy food every week.